Outside, it’s a crisp, cold day. Some years, a fog rolls in over the hills, enveloping the pine trees in a soft, fluffy blanket. Others, the first snow of the season begins to fall. Inside, a fire roars to life, setting the first floor of my Grandparent’s home into a warm and cozy daze. My sister and I (typically dressed in a fancy matching holiday ensembles) are assigned table setting duty, laying out the fine china, placing the forks in the perfect order, drawing up place cards and even adding some decorative touches of Autumn (aka leaves, pinecones or acorns) harvested from the woods behind the house. The kitchen is a blur of pots, pans and overwhelmingly good smells. Chatter drifts out from the den where the guys have gathered to watch the football game, a sound that is only trumped by the occasional playing of the piano. When dinner is served, we all hungrily dig into a traditional feast- roast turkey, stuffing, gravy, mashed sweet and regular potatoes, rolls, creamed onions and mushrooms, green beans, cranberry sauce and salad. We then break for hikes and naps before finishing our meal with coffee and lots of pie (pumpkin, apple, pecan). Afterwards, it's time to settle down in front of the fire to read and play games before indulging in leftovers a few short hours later. This, this was my Thanksgiving Day. I was determined that this would always be my Thanksgiving Day. But life happens. You grow up and things change, people change, places change. At first, adapting to a new Thanksgiving was something I did NOT want to do. As far as I was concerned, Thanksgiving wasn’t even worth celebrating if it was going to be anything but what I was used to. However, I can’t resist a holiday that revolves around food, so eventually I began embracing a “new” Thanksgiving, and surprisingly, when I wasn’t too busy missing certain traditions, I noticed it still had a lot of the things I loved about the holiday of my childhood. It’s fun to experiment and try new things (like these Thanksgiving egg rolls with cranberry chutney or these stuffing filled latkes with cranberry aioli), it’s fun to make your own traditions, and but mostly, it’s fun to be able to eat and drink with family and friends, no matter what new or old (I’m looking at you creamed onions and mushrooms!) things are involved. I’m not alone when it comes to an altered Thanksgiving. According to a new survey conducted by Ocean Spray®, half of all Americans say their Thanksgiving dinner has evolved to incorporate traditional and globally-inspired fare. They even created this beautiful, interactive graphic with some of their findings as well as what a table looks like then & now (tip: hover over the pictures to get recipes and hosting tips, and then be sure to follow them on social media- Facebook, Twitter, Pinterest, Instagram, Youtube- for even more Thanksgiving ideas). Recently, I was able to take my own bite out of a past & present Thanksgiving meal. 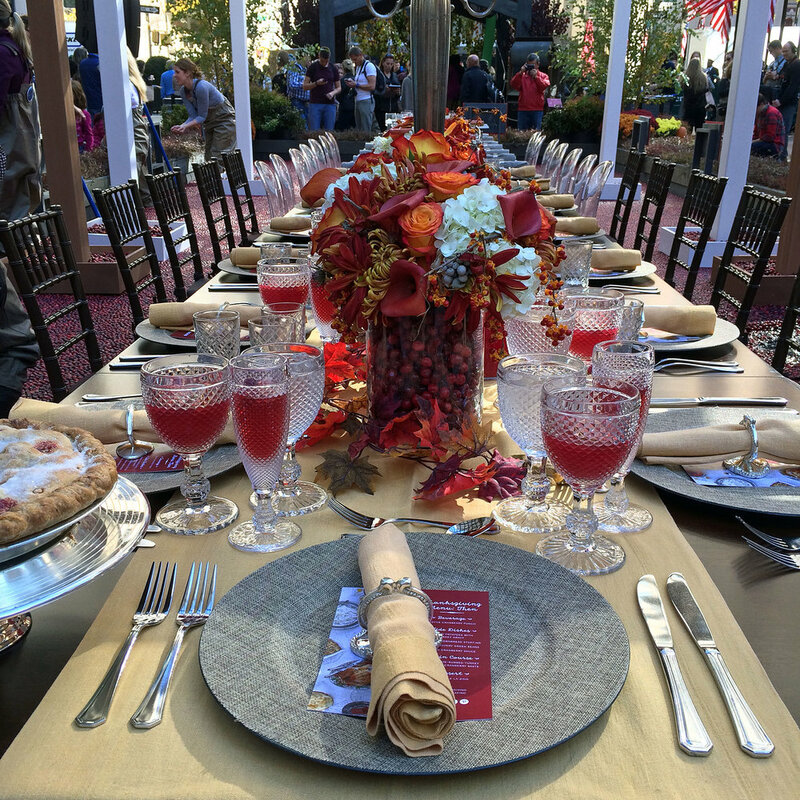 I joined Ocean Spray and special guest, Australian Celebrity Chef Curtis Stone, to explore the evolving Thanksgiving table from, get this, inside their cranberry bog display in Rockefeller Center® (yes, a cranberry bog....in the middle of the city....say whaaaat?!). Chef Stone shared some of Thanksgiving’s most delicious dishes – incorporating traditional tastes, modern tweaks and influences from around the globe – sure to satisfy Thanksgiving traditionalists and Turkey Day daredevils alike. In true Thanksgiving fashion, each dish featured this fall’s number one ingredient: the cranberry straight from the Ocean Spray bogs. Ocean Spray is a grower-owned cooperative celebrating its 85th anniversary this year. Ocean Spray is made up of more than 700 grower-owners, many of whom have enjoyed the farming way of life for generations. Talk about traditions, right? But, despite how long they've been around, Ocean Spray® Fresh Cranberries are no longer reserved just for everyone’s favorite cranberry sauce. Those pretty red berries are showing up in everything from drinks to appetizers to desserts and even in table decorations. I myself have used them in things like pop tarts, salad dressing, and even a festive smoothie. At the event I attended, Chef Stone used cranberries for traditional things like turkey with white cranberry baste and apple pie a-la-zing (aka with cranberries), as well as updated dishes, like ham with cranberry gastrique and white chocolate cheesecake with port-glazed cranberries. Right in line with the findings of the Ocean Spray survey, I was more than content with a spread that included dishes from both then and now!